This is the first image I’ve ever seen of someone putting up stickers. I found it in two issues of an I.W.W. 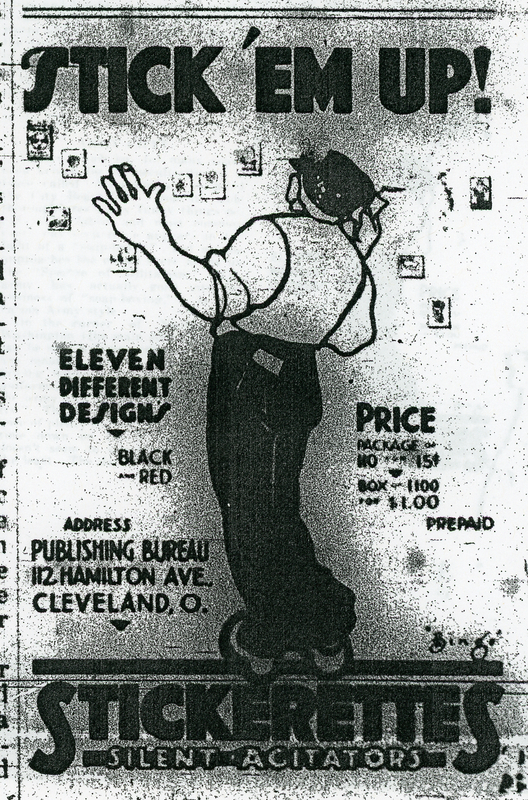 newspaper called Solidarity published in Cleveland on September 9 and 16, 1917. Stickerettes were advertised in Solidarity between at least June 24, 1916, and August 25, 1917, though I’ve seen a reference that they might have been advertised as early as November 20, 1915. In 1916, one could buy stickerettes in packages – 110 per package cost 15 cents, or a box of 1,100 cost $1.00. I’ve been trying to find photographs of stickerettes put up on buildings or other surfaces, too, but no luck yet.